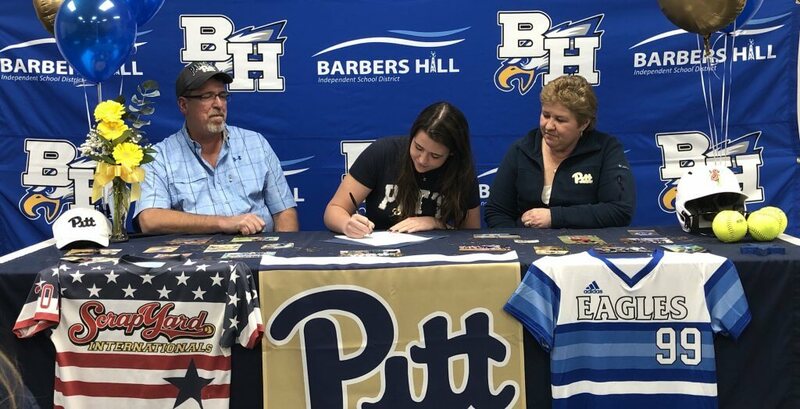 Rebecca Miller, a 2019 All-State pitcher from Barber's Hill (Mont Belvieu, Texas) High, has signed with Pitt. A huge week as we have 101 signings, verbals or club team changes added to the database involving softball programs such as Alabama-Birmingham, Arizona State, Auburn, Florida State, Missouri, Oklahoma State, Oregon, Pitt, Utah, Virginia Tech and more. Highlighted club programs with multiple players added include Aces Fastpitch (based in Missouri), Explosion (California), Lil Saints (Arizona), SoCal Choppers (California) and Turnin2 (Michigan). Our player spotlight this week is Rebecca Miller, a 2019 pitcher from Barber's Hill (Mont Belvieu, Texas) High who will pitch at Pitt and plays club ball for the Scrapyard Internationals 18U team. Rebecca is a three-time All-District pick and earned 1st Team All-State honors last year.